With a focus on water and wastewater technologies, the Wasser Berlin International 2013, a capital goods trade fair and congress for water technologies, took place from April 23 - 26, 2013 in Berlin, Germany. Ecologic Institute, as part of the FP7WaterDiss2.0 project, organized several presentations, displayed information at the stand “Center of Excellence for Innovation” and enabled five high-profile European-funded projects to interact with interested stakeholders. The Wasser Berlin International is an established trade fair that brought together experts, businesses and policy-makers from the international water industry over a period of four days. 31.000 visitors attended the fair, where 651 exhibitors from 35 different countries showcased their latest technologies, products and services on the subject of water supply and wastewater displayed technologies in six large halls. 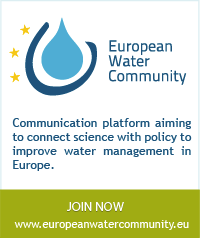 The WaterDiss2.0 project, which aims to improve the communication and market uptake of innovative EU-funded research to support the implementation of European water policy, used the presence at the Wasser Berlin International to promote five of the projects it supports. Ecologic Institute, a partner in the WaterDiss2.0 project was present with a stand at the “Centre of Excellence – Innovation”, where latest developments from five European-funded research projects were showcased. Each of the projects had the opportunity to hold a presentation on one day of the fair, which were given by an expert from the project consortium. Following the presentation, the experts were available for questions and answers at the stand and engaged in discussions with the audience. Conversations with up to 100 visitors were held, representing business, politics and science. The presentations and displayed information focused on tackling emerging pollutants and pharmaceuticals in water and waste water, methods to protect freshwater biodiversity and technologies for coastal management. THESEUS, Innovative technologies for safer European coasts in a changing climate, video presentation by Barbara Zanuttigh on 23 April 2013: The THESEUS project focuses on coastal areas, which are vital economic hubs but are threatened by environmental problems including erosion, flood risk and long-term habitat deterioration. The project developed a systematic approach to reduce the risks to our coasts and maintain their benefits for human use. Risk assessment, policy management and planning strategies have been worked out in cooperation with stakeholders and local authorities through applications in eight study sites, with specific attention to the most vulnerable environments such as estuaries, wetlands and deltas. PHARMAS, Ecological and human health risk assessments of antibiotics and anti-cancer drugs found in the environment, presentation by Rodrigo Vidaurre on Wednesday 24 April 2013: PHARMAS is dedicated to the ecological and human risk assessment of antibiotics and anti-cancer drugs released in the environment. PHARMAS investigated the potential short- and long-term human health and environmental impacts for these compounds. The project produced new data on environmental concentrations and effects on aquatic organisms. A prototype web-based classification system is being developed aiming to enable European citizens to make their own informed decisions about the risk posed by human pharmaceuticals to their health and to the health of the environment. BIOFRESH, Biodiversity of Freshwater Ecosystems: Status, Trends, Pressures and Conservation Priorities, presentation by Timo Kaphengst on 25 April 2013: BioFresh puts together the scattered pieces of information about life in our rivers and lakes through a global information platform that brings together, and makes publicly available, the vast amount of information on freshwater biodiversity currently present in a wide range of databases. TECHNEAU developed adaptive supply system options and new and improved treatment and monitoring technologies. Treatment technologies include membrane and oxidation based multi-barrier schemes, providing safety against a broad spectrum of chemical and microbiological contaminants. The recently started DEMEAU project follows TECHNEAU by demonstrating some of the promising technologies developed previously and focuses on technologies that tackle emerging pollutants in water and waste water. The project will conduct research and demonstrate managed aquifer recharge, hybrid ceramic membrane filtration, hybrid advanced oxidation processes and bioassays at utilities.